A top of the line, carbon fiber bicycle, the Blue AC1 SL, by Blue Competition Cycles, is designed with SFT2 Super Flow Tube Tech to increase aerodynamics and stiffen the ride, increasing power transfer. 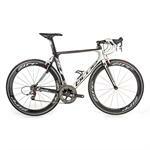 The Aerus Conquest T1000/T800 high modulus carbon frame is light and fast. With SRAM Red, the bike weighs in at less than 14 pounds, that’s UCI illegal, but who wants to be legal. The huge bottom bracket is a plus when charging for those sprint finishes as the power from your legs is directly transferred to the bikes acceleration. Bicycling Reviews the AC1 SL Video! « Nemo Fillo – Backpacking Pillow Extraordinaire!